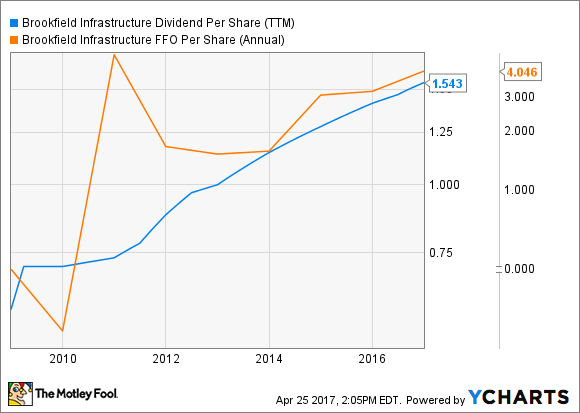 How Sustainable Is Brookfield Infrastructure Partners L.P.'s Dividend? The entire business is built on creating a sustainable stream of cash flows. Management says it can grow distributions every year, too. Dividend investors are often on the hunt for a high yield. The problem in many cases is that the higher the yield, the more likely it is that it's at risk of getting cut. So what about global infrastructure master limited partnership Brookfield Infrastructure Partners L.P. (NYSE:BIP)? 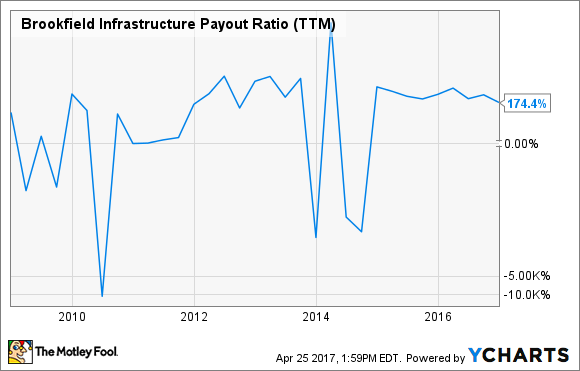 Brookfield Infrastructure yields a hefty 4% at recent prices, a nice payout for investors looking for big income from their portfolio. Frankly, Brookfield Infrastructure Partners' dividend is very sustainable and is more likely to go up than fall. Let's take a closer look at what makes this not only a strong dividend investment but why it could be one of the best dividend growth investments you can make. Not only are many of Brookfield Infrastructure's assets just as important during periods of weak economic demand, but almost half of its revenues are under long-term contracts. BIP Payout Ratio (TTM) data by YCharts. The problem with this metric is that much of the partnership's asset value is in real estate and long-lived assets, which while they depreciate, don't actually lose value and won't require major capital investments to replace or maintain. Because of this, using funds from operation, or FFO, instead of earnings per share, will give us a better idea of how much of its "real" cash flows Brookfield Infrastructure can afford to pay out. BIP Dividend Per Share (TTM) data by YCharts. The table above also shows how well Brookfield Infrastructure's management has done at growing cash flows. This has allowed it to easily meet the stated goal of 5%-9% annual distribution growth. Last year, distributions per share increased a solid 11%. Brookfield Infrastructure Partners is a master limited partnership, or MLP, with Brookfield Asset Management Inc. acting as the general partner. This is important for two reasons. First, Brookfield Infrastructure is different than many other stocks, in that it's not a corporation which makes profits and pays corporate income taxes. The positive part of this structure is that it makes for a very cash flow-efficient structure, allowing it to generate and pass along more cash to its partners and unitholders (MLP-speak for shareholders) than a typical corporation would. The downside is twofold. First, distributions you get from an MLP can be taxed differently -- and at higher rates -- than regular dividends paid by traditional corporations. This could mean that, while yielding a solid 4%, your share of those distributions could end up being taxed at your marginal tax rate, and not the 15% or 20% long-term gains rate at which most dividend income is taxed. Second, you may want to think twice before sticking Brookfield Infrastructure in your IRA or 401(k), because of something called UBTI, or unrelated business taxable income. Since MLPs aren't taxed at the federal corporate income tax level, you could end up getting taxed on distributions in your retirement account above a certain level. With the caveat that, like all other MLPs it's probably best avoided in retirement accounts, Brookfield Infrastructure Partners is a solid dividend investment. Management has proven very capable at managing the business, investing in growth, and taking advantage of opportunities to further expand and diversify into new markets while staying true to the core focus of the partnership. Whether it's income today or long-term dividend growth you're looking for, Brookfield Infrastructure Partners should prove as sustainable a dividend investment as you'll find.